Leading Wholesale Trader of foetal heart monitor from Mumbai. We are one of the well established manufacturers and suppliers of Foetal Heart Monitor. This is an instrument to measure the frequency of heart beats in a specific time. 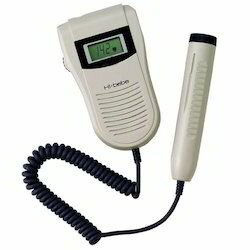 Heart monitors of present days are cons of chest strap transmitters and signal receivers or cellphones. Advanced versions of Heart Monitor can measure multiple parameters of human body such as variation in heart beats, respiratory rates etc. These devices are useful for treatment of patients having heart or respiratory problems. Looking for Foetal Heart Monitor ?